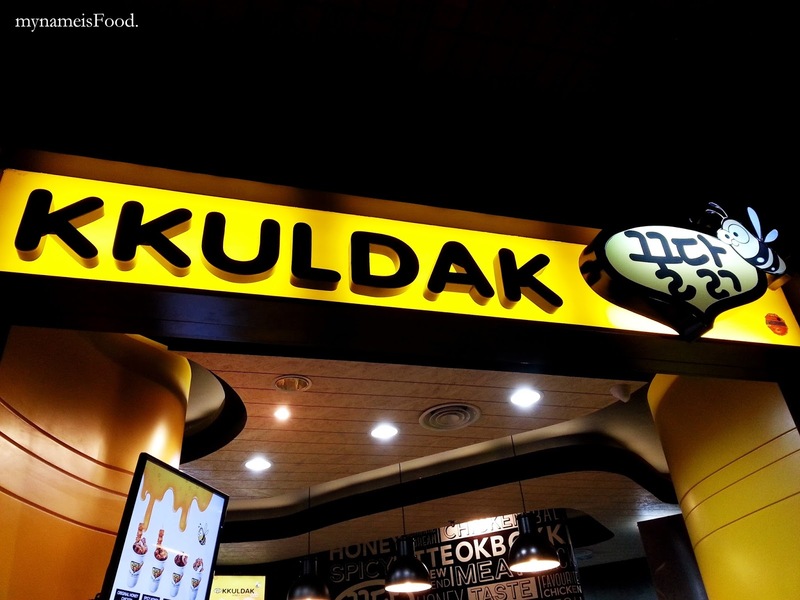 Kkuldak, Grand Indonesia, Jakarta, Indonesia - my name is Food. KkulDak (꿀닭) literally means 'Honey' and 'Chicken' together in Korean.. 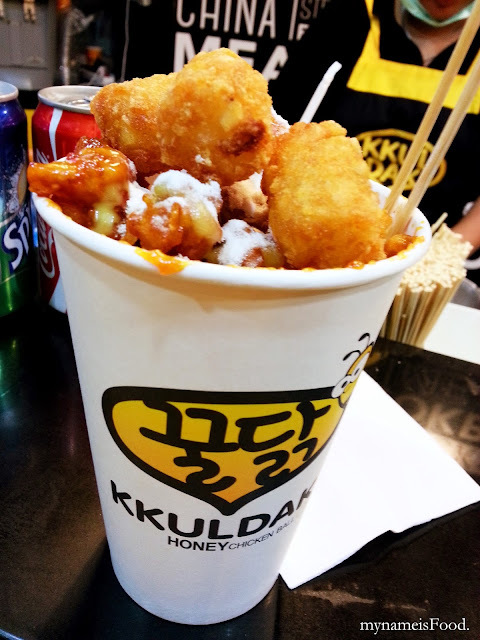 This reminds me of a Korean street food stall, just that it is located in a mall. So the way this works was that you order what you want off the menu, wait while your order is being freshly made and just wait for your number to be called out. Another thing that is quite convenient is that you don't need to worry about eating messy or whether it'll be large bits of chicken meat in your cup but it has already been cut into bit size pieces for you which is great. It consists of chicken, potato gems and rice cake.. Three in one? Score! I originally thought it wasn't everything in a cup.. So I just hoped that it was balanced between the three.. 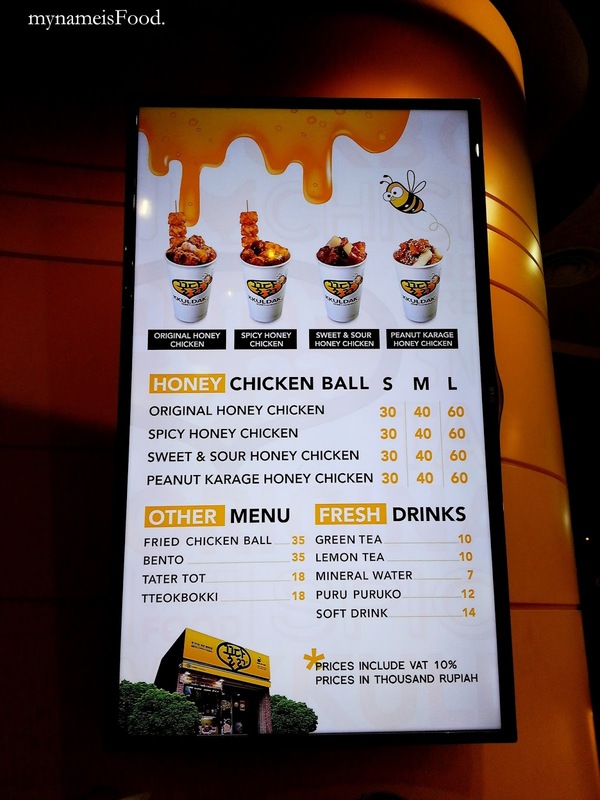 Since there were 4 different flavour options for your Honey Chicken Balls and in 3 different sizes, it allows you to order as much or as little as you want.. well, the small is actually a decent portion too. The way that the whole thing is wrapped up is that the battered chicken balls are first deep fried then pan fried in whichever sauces you pick (Honey, Sweet and Sour and so on). Since they pan fry or just mix it in a bowl quite quickly, the crunchiness of the outer layer isn't lost. However, sometimes when there are many people waiting in line, you may get some parts that have been just sitting there in the bowl or so. 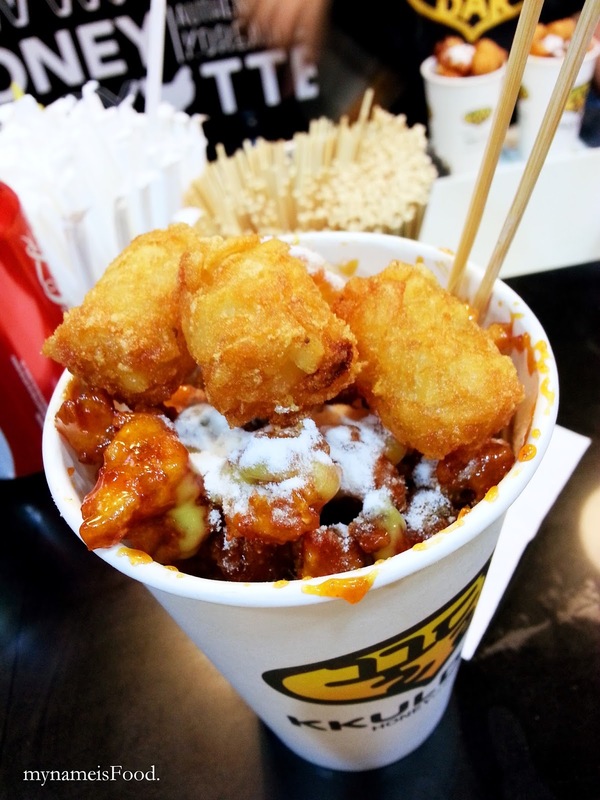 At the end, after they've filled up your cup to the top, they place 2 wooden skewers and asks if you would like either Cheese Powder or Mustard sauce on top, in which we chose the Cheese powder of course.. Reminded me of like those Mozarella cheese powders you can get from Woolies or something over here..
We bought their 'Sweet and Sour Honey Chicken' (M: IDR40rb - AUD$4) Overall, it was a fun yet delicious treat and snack but it can get messy since you try and get it out of the cup and sometimes it can be sticky and such... But, it was done well, filled right up to the top, made in front of your very eyes and remember to be careful when you eat it right after you do receive your Kkuldak..... I burnt my tongue on my first bite.. Woops.